Yesterday was January 19th of 2013....it was exactly one year ago yesterday that we heard the words that no parent every wants to hear, "I'm sorry, there is something wrong with your baby." That was the day that our world started to fall apart. The 6 weeks that followed were the hardest and most difficult weeks of my life. I cannot believe that the next six weeks will be the last six weeks before we get to meet this baby. I've been a hormonal mess...every time I start to cry I blame the hormones. I figure I have a few more weeks that I can get away with that. This little boy is doing well. We had our first Non Stress Test (NST) yesterday and he passed with flying colors. I have been monitoring my gestational diabetes and so far I have been able to control it with just a diet change. Its not easy though, Im frequently hungry. Our baby shower is coming up too. I think Im too scared to get excited though. DH told me the other day that we were going to have our baby in less than 6 weeks but he thinks that I don't actually believe that it will happen. I think he is probably right. I don't think I will believe it until this little boy is safely in my arms. 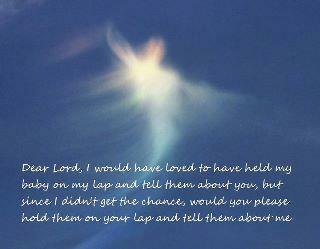 When I first went to the support group for bereaved parents I met a few ladies that I have stayed in contact with. It was funny when, over this past summer, we all four found out that we were pregnant and due within a few weeks of each other. Well, all three of them have had their babies and they all had boys....and, I can honestly say I was happy for each one of them. Now its just me.....and hopefully in a little over a month our bundle of joy will be in my arms too!!!!!! !